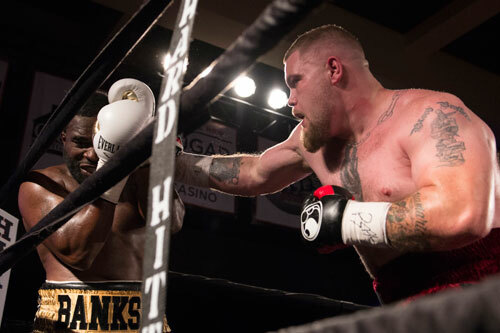 Local heavyweight favorite Joey “The Tank” Dawejko returned to his hometown for the first time in more than two years Friday night when he headlined an eight-bout card at Philadelphia’s Sugar House Casino, in a show promoted by Hard Hitting Promotions. 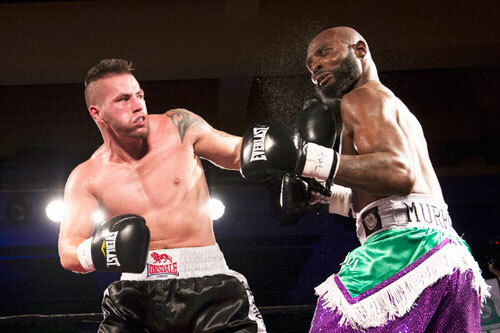 Joey didn’t waste much time setting the tone in his fight with Detroit’s Demetrius Banks. Dawejko stalked his foe from the opening bell, looking for an early night. He took the first round before kicking things up a gear in the second. Joey slammed Banks with a hard right hand that put him down. Dawejko was clearly feeling himself on this night, which followed a long layoff due to an injury and a ruined comeback bout in April that ended in a disputed draw. When Banks his the canvas, Joey taunted him from above and you could tell that he really wanted the fallen fighter to rise. Banks did, and Joey jumped right on him. Another explosive left-right dropped Banks again, but he managed to last the round. 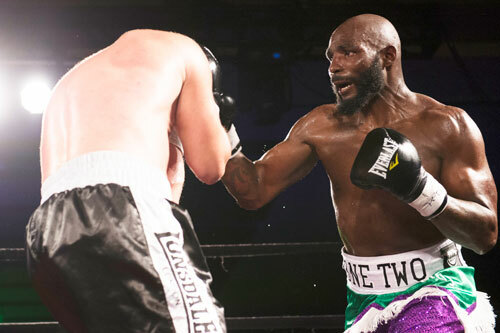 In the third round however, Banks could not avoid the steadily rolling tank before him. 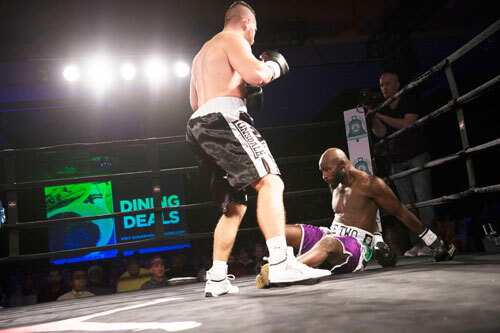 Dawejko pounded a left to the body that softened Demetrius. Then a left hook to the head by Dawejko hurt Banks again. 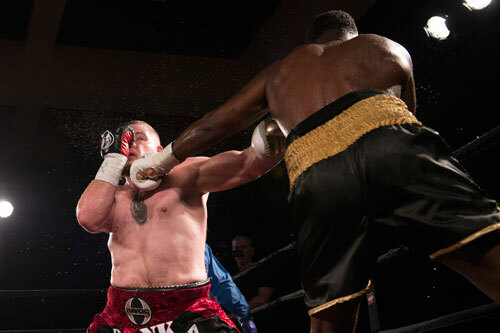 Dawejko kept punching and finally drilled Banks with a jab that put him down again. 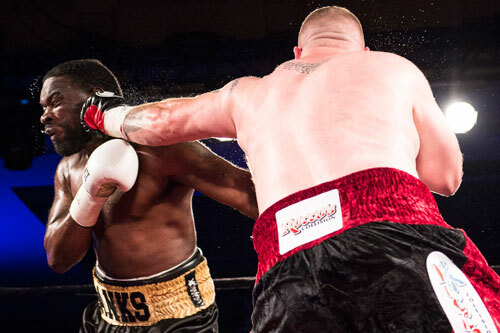 Referee Shawn Clark halted the scheduled eight rounder to secure Dawejko’s hometown win. 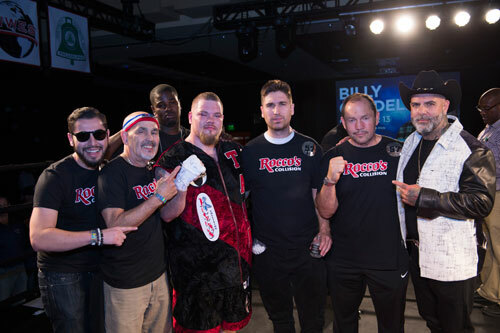 The end came at 1:22 of round three, and the victory improved Dawejko’s resume to 18-4-4, 11 KOs. Banks slipped to 9-2, 4 KOs. Dawejko looked in good form, firm and muscular, at 239 pounds. It was not the lightest weight of his career, but far from his heaviest. At 27, Joey is in a heavyweight’s prime, and eagerly seeks a significant fight to put him into the rankings. 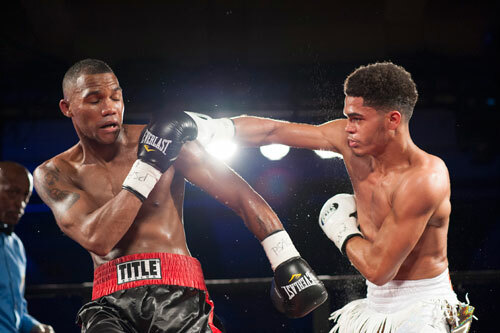 Teenage Philly lightweight phenom Branden Pizarro, 8-0, 4 KOs, won by fourth round TKO over Tyrone Luckey, Neptune, NJ, 8-8-3, 6 KOs, in a scheduled six rounder. 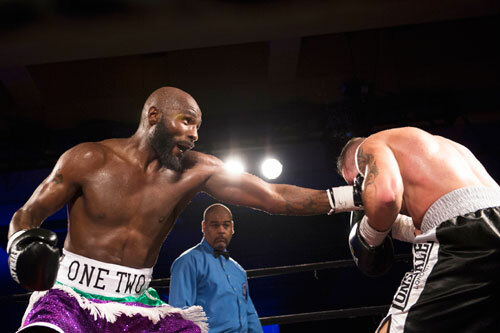 After sweeping the first two rounds, Pizarro scored two knockdowns in the third round, one from a sharp left hook, the other from an overwhelming combination, and then dropped Luckey again in the fourth with another left hook. 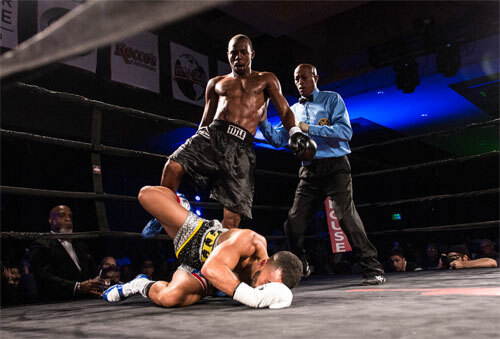 The moment Luckey fell for the third time, referee Ronald Bashir stopped the fight and called it a TKO for Pizarro. The time was 26 seconds of the fourth round. Pizarro continues to cruise through his career. He’s had a lot of easy matches, but has also handled tougher fare as well. The inappropriately named Luckey is a hard-luck journeyman who is a good test for anyone. Luckey landed a few decent shots, but the 17 year old Pizarro was in control all the way. 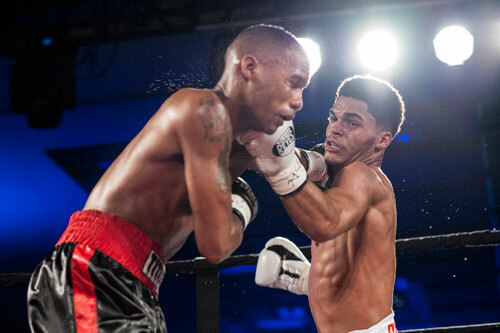 Philadelphia welterweight Raymond Serrano, 23-4, 10 KOs, suffered a first round knockdown, but went on win a six round unanimous decision over Zack Ramsey of Springfield, MA, 8-2, 4 KOs. Serrano was in charge for most of the first round, but then Ramsey landed a right that send Serrano tumbling forward. Serrano made it to his feet and appeared to be okay from the assault. The round ended, but because Serrano had controlled the majority of the round, I only gave it to Ramsey by a 10-9 margin. In round two, Serrano continued boxing well and swept round after round. His right hand was popping Ramsey the rest of the way, and he made no mistakes like the one in the first that put him on the canvas. In the final round, Ramsey got to him again, but Serrano withstood the attack and finished the fight on his feet. After six full rounds, Serrano took the unanimous decision. Judges Gail Jasper and Lindsey Page scored it 57-56, while Alan Rubenstein saw it 59-55. My score was also 59-55. 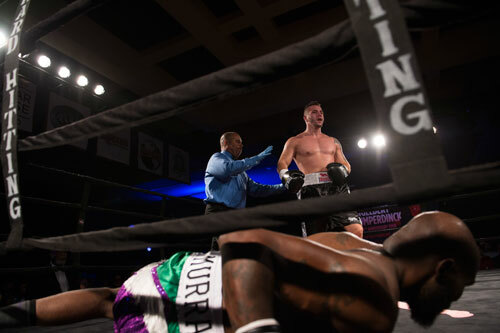 Hands down, the fight of the night was a light heavyweight slugfest between local David Murray and Hungarian Attila Koros. 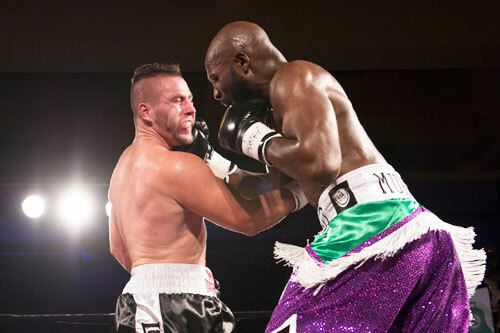 The scheduled six rounder exploded from the start with Murray landing a good right and Koros firing back with a right of his own that toppled Murray. David, hurt badly, struggled to his feet but survived the round. In the second, another right by Koros crashed against Murray’s chin and the local hit the canvas again. The fight appeared to be all but over. However, Murray has begun to build a reputation as a comeback king. 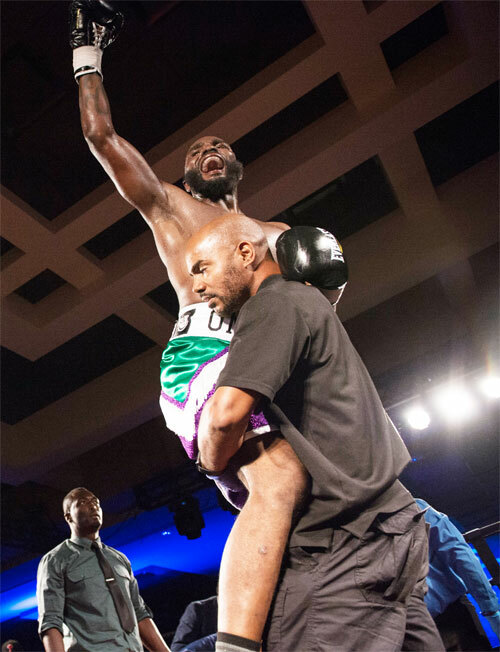 He’s returned from the brink in a few recent fights, including a no-hoper at the Liacouras Center in April. Murray made it through the second round, and then things began to turn slowly in the third. The turnaround wasn’t obvious at first. Koros kept hammering Murray and stayed in control. However, Attila began puffing and eventually let his mouthpiece slip out, in an attempt to take a little rest. The first time, it didn’t register with many at the Sugar House. But make no mistake, this was the true shift in the bout. Twice more in the third, Koros’ mouthpiece hit the floor and each time the action stalled for a few precious seconds. He was getting tired and needed any breather he could get. Koros won the fourth round too, landing two particularly hard rights and a terrific left hook. Each punch threatened to drop Murray again, but the starch in Koros’ punches was sapping. Instead of Murray, it was Koros’ mouthpiece that hit the floor in this round. In the fifth, Koros landed a good left-right, but it was his last gasp. Exhausted, he let his mouthpiece fall two more times. The second time, referee Shawn Clark penalized Koros one point for the continued tactic. But as it turned out, points would not matter in this one. Murray, hopelessly behind on the cards, pressed forward and landed a hard right. Koros crumbled to the ground and took the full ten count. The fight was over and the crowd was going crazy. The time of the KO was 2:53 of the fifth. The fight was a thriller and ended dramatically. It will have to be in the running for the best Philly fight of 2017. Murray has finally found his niche. He’s a suddenly a blood and guts, back from the brink brawler. He might be able to win fights easier, but this is how to entertain boxing fans. Murray raised his record to 7-1-1, 6 KOs, and Koros fell to 14-12-1, 10 KOs. 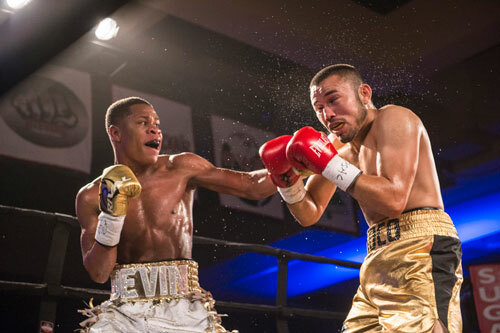 In a free-swinging lightweight bout, Devin Haney, Las Vegas, remained undefeated, 17-0, 11 KOs, with a one-sided eight round points win over Mexican Enrique Tinoco, 16-5-3, 12 KOs. Tinoco landed plenty of shots, but Haney dominated in every round. The final scores were 80-71 and 80-72 twice, all for Haney. Philly junior featherweight Angel Pizarro, 3-0, 2 KOs, dropped Joseph Cole of Louisiana, 1-3, 1 KO, once in round one and once in the second. 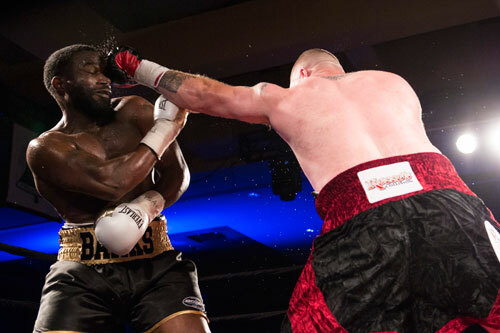 After Cole returned to the action after the second knockdown, Pizarro nailed him with single right hand that prompted referee Ronald Bashir to stop it. The time was 1:54 of the second round. This was Pizarro’s first fight after a nearly one year layoff. 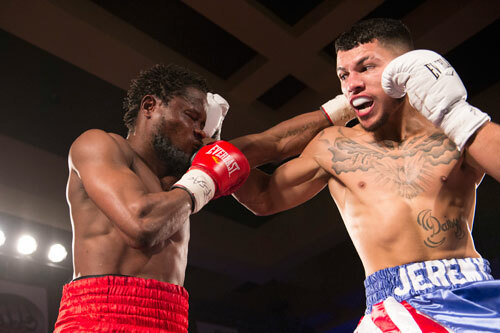 With just four previous bouts under his belt, Philly lightweight Jeremy Cuevas, 5-0, 4 KOs, stepped up well against 46-bout vet Justin Savi, 31-14-2, 21 KOs, and scored a third round TKO. 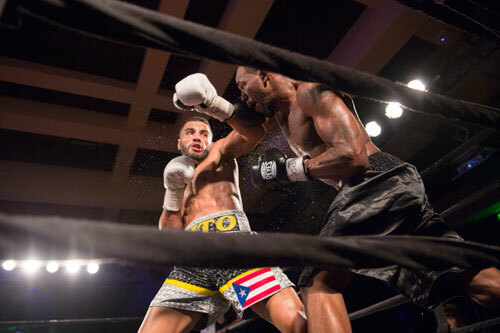 Cuevas dominated the action in every round and was credited with a knockdown in round two, when the corner pad kept the Louisiana-based boxer on his feet after a Cuevas flurry. Finally in round three, after an extended rally by Cuevas, referee Shawn Clark halted the bout at 1:25. In the opening bout of the night, local bantamweight Ernesto Almodovar, 2-0, 1 KO, stopped Cincinnati's Trevor Ballinger, 0-2, at 1:28 of round one. After the two boxers traded rather evenly in the first two rounds, Almodovar began pinning his foe in the corners and landing heavy combinations. After one such combo in the final round, referee Shawn Clark stepped in and stopped it. 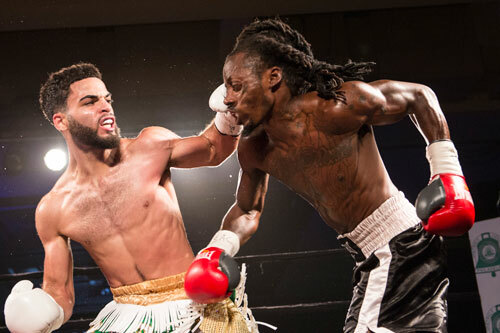 One fight scheduled for six rounds, Samuel Teah vs. Istvan Dernanecz, was scratched on fight night when the Hungarian lightweight’s medical test results were not received by the PA Commission in time. 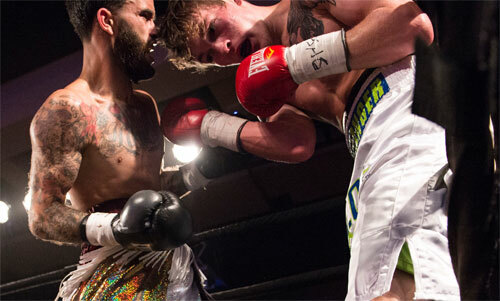 The show drew a capacity crowd at the Sugar House Casino Event Center.